It may seem a big, crazy and daunting place when you first arrive here...especially if you’re jetlagged after a 10+ hour flight! But don't let the chaotic traffic and searing heat put you off this mesmerising metropolis! Once you've cracked this crazy town, you won't want to leave. Always get the metered taxis. They come in a variety of colours and can be hailed down at the side of the road. Your meter should always start at 35 Baht (40p). If the driver tries to agree a price with you before you get in, simply decline polity and wait for another taxi to come along. The SkyTrain or BTS as it is referred to, is a fast, easy and cheap way to get around many areas of Bangkok. All the signs are in English so again you will have no problem navigating around. Tuk Tuk's can be fun for the experience but they will often over charge, so stick to the metered taxis wherever possible. Bangkok has the ultimate range of places to stay from budget hostels to stunning five stars hotels. You could find many hostels in Bangkok that will have dormitory beds for as little as 100 baht (£2) a night and private rooms from around 250 baht (£5). So, depending on how high or low you want to go is up to you. Even the budget hostels are all clean, safe and central, which is great news if you’re on a budget. Always eat from the street vendors as you'll pay around 30-50 baht (50p-£1) for a nice meal... compared with a restaurant that will charge you double. Although, if you find your stomach isn't handling street food so well in the early stages on your trip, work up to it! Again you will pay more in the bars, so going to the 7-11s is a lot cheaper. Although a lot of bars in Thailand will let you buy whole bottles of Thai whisky 'Song Thong' for around £8, so between a group of friends it can be cheap! 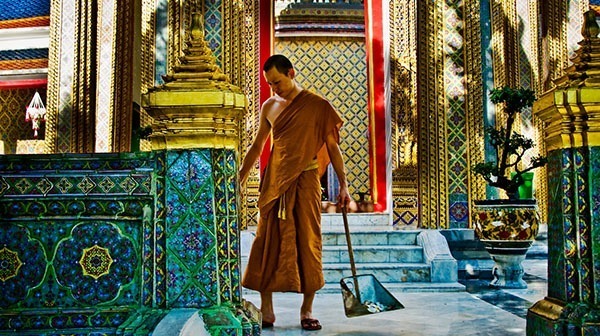 Bangkok has many beautiful, old, Buddhist temples dating as far back as the 9th century. The Royal Palace and Famous Reclining Buddha do charge between 100-200 baht (£2-4) to gain entry but there are lots of free amazing examples of Buddhist temples dotted all around the city. Although the glitzy shopping malls of Siam maybe fully air conditioned and seem very enticing... they are also very expensive. Bangkok is the ultimate bargain hunters paradise, where you can literally buy anything you can imagine... it may not be the genuine article but the Thai's are renowned for their near perfect imitation! Always remember 'Thailand' literally translates into 'The Land of Smiles' so no matter how lost or stuck you become, you're lucky to be around some of the nicest people in the world who will always do what they can to help. Last updated by Maria Holburt on 29 September, 2013 in Travel Tips. I've lived in Thailand this time for 4 months and it's my third time here. I've never been sick on Thai food, and I don't have the strongest stomach any more. I wouldn't worry about eating street food too much as long as you go to places that are busy, are cooking the food quickly and it hasn't been sitting there (cooked) all day. Don't come to Thailand (or Bangkok especially) if you like drinking a lot. Wine is heavily taxed and complete rip off. I suppose that depends on your stomach! I've had better luck with busy street food stands than mid-range restaurants. Nice tips - although I'm not sure my doctor would agree with the street food recommendation.